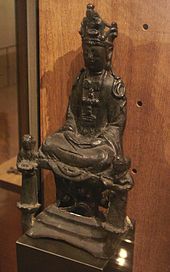 The Virgin Mary disguised as Kannon, Kirishitan cult, 17th-century Japan. Salle des Martyrs, Paris Foreign Missions Society. Kakure Kirishitan (Japanese: 隠れキリシタン, lit. '"hidden Christian"') is a modern term for a member of the Japanese Catholic Church during the Edo period that went underground after the Shimabara Rebellion in the 1630s. 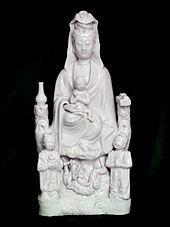 A Dehua porcelain "Guanyin bringing child" statue, interpreted to be "Maria Kannon" in connection with Christian worship. Nantoyōsō Collection, Japan. Kakure Kirishitans are called the "hidden" Christians because they continued to practice Christianity in secret. They worshipped in secret rooms in private homes. As time went on, the figures of the saints and the Virgin Mary were transformed into figurines that looked like the traditional statues of the Buddha and bodhisattvas; depictions of Mary modeled on the Buddhist deity Kannon, goddess of mercy, became common, and were known as "Maria Kannon". The prayers were adapted to sound like Buddhist chant, yet retained many untranslated words from Latin, Portuguese, and Spanish. The Bible and other parts of the liturgy were passed down orally, because printed works could be confiscated by authorities. Because of the official expulsion of the Catholic clergy in the 17th century, the Kakure Christian community relied on lay leaders to lead the services. In some cases, the communities drifted away from Christian teachings. They lost the meaning of the prayers and their religion became a version of the cult of ancestors, in which the ancestors happened to be their Christian martyrs. Kakure Kirishitan was recognized by Bernard Petitjean, a Catholic priest, when Ōura Church was built in Nagasaki in 1865. Approximately 30,000 secret Christians, some of whom had adopted these new ways of practicing Christianity, came out of hiding when religious freedom was re-established in 1873 after the Meiji Restoration. The Kakure Kirishitan became known as Mukashi Kirishitan (昔キリシタン), or "ancient" Christians, and emerged not only from traditional Christian areas in Kyushu, but also from other rural areas of Japan. The majority of Kakure Kirishitan rejoined the Catholic Church after renouncing unorthodox, syncretic practices. 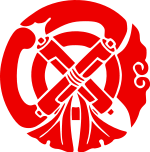 Some Kakure Kirishitan did not rejoin the Catholic Church, and became known as the Hanare Kirishitan (離れキリシタン, separated Christians). Hanare Kirishitan are now primarily found in Urakami and on the Gotō Islands. Following the legalization of Christianity and secularization of Japan, many Hanare Kirishitan lineages ended abruptly. Traditionally, boys learned the rituals and prayers from their fathers; when boys were uninterested or moved away from their homes, no one was left to continue the lineage. For a while, Hanare Kirishitans were thought to have died out entirely because of the secretive nature of their practices. A group on Ikitsuki Island in Nagasaki Prefecture, which had been overlooked by the Japanese government, made their beliefs public in the 1980s and now perform their rituals for audiences; however, these practices have acquired some attributes of theatre, such as the telling of folktales and the use of statues and other images which most underground Christians never used. The anthropologist Christal Whelan uncovered some Hanare Kirishitans on the Gotō Islands where Kakure Kirishitans had once fled. There were only two surviving priests on the islands, both of whom were over 90, and they would not talk to each other. The few surviving laity had also all reached old age, and some of them no longer had any priests from their lineage and prayed alone. Although these Hanare Kirishitans had a strong tradition of secrecy, they agreed to be filmed for Whelan's documentary Otaiya. Shūsaku Endō's acclaimed novel Silence draws from the oral history of the local Kirishitan communities pertaining to the time of the hiding of the Christians, as do certain of his short stories, including "Mothers" and "Unzen." The novel was adapted to film by Masahiro Shinoda in 1971 and by Martin Scorsese in 2016. Noted Japanese composer Yasuhide Ito has written a well-known work for symphonic band, called Gloriosa, that was inspired by the music of the Kakure Kirishitans. Nagisa Oshima's 1962 film Amakusa Shirō Tokisada (The Rebels), about the Shimabara Rebellion, is named after the leader of the rebellion Amakusa Shirō. The anime series Rurouni Kenshin featured a story arc inspired by the Kakure Kirishitan. The lead antagonist of the story arc is a swordsman named Shougo Mutou, who claims to be the second coming of Shiro Amakusa and gets ready to start an armed Christian rebellion, similar to the Shimabara Rebellion. Shougo and his sister Sayo, nicknamed Magdaria (after Mary Magdalene), are the only survivors of a whole Kakure Kirishitan village destroyed during the Restoration wars, that took place years before the story arc itself took place. After Sayo's death and Shougo's imprisonment, the Restoration government exiled Shougo and the rest of his followers out of Japan, fearing any possible future rebellion from them. The current Dutch Ambassador for Japan financed their travels out of Japan, accepting them as guests back in the Netherlands. This mimicked the real life event of 1639 or perhaps was even based on it, where the Shogunate decided to exile Hirado Japanese women married to Dutch and British men, along with their children. These Eurasian families later on were sent to Batavia (later on renamed as Jakarta by the Japanese around three centuries later) on Dutch ships, where the multi-national United East Indies Company (Vereenigde Oostindische Compagnie) had its Asian headquarters. ^ a b c d "S". Encyclopedia of Japan. Tokyo: Shogakukan. 2012. OCLC 56431036. Archived from the original on 2007-08-25. Retrieved 2012-08-09. ^ a b "隠れキリシタン" [Kakure Kirishitan]. Dijitaru Daijisen (in Japanese). Tokyo: Shogakukan. 2012. OCLC 56431036. Archived from the original on 2007-08-25. Retrieved 2012-08-09. ^ Boxer, C. R. (1951). The Christian Century in Japan: 1549–1650. University of California Press. p. vi. ^ Schumacher, Mark. "Virgin Mary & Kannon, Two Merciful Mothers". A to Z Photo Dictionary: Japanese Buddhist Statuary. Retrieved 11 May 2016. ^ "Kakure Kirishitan". Catholiceducation.org. 2000-02-04. Retrieved 2012-12-21. ^ "Yasuhide Ito". Bravo music. Retrieved 2007-12-02. ^ a b "Review". Wasbe. Sep 2001. Archived from the original on 2008-05-13. Retrieved 2007-12-02. ^ "Yasuhide Ito". Composers' Corner. Philharmonic winds. Archived from the original on 2007-09-20. Retrieved 2007-12-02. ^ "平戸観光協会". History. Hirado net. Retrieved July 10, 2014. "Ikitsuki Journal; Once Banned, Christianity Withers in an Old Stronghold", The New York Times, Dec 25, 2003 . "Lack of Oppression Hurts Christianity in Japan", The New York Times, Sam Sloan, Apr 3, 1997, archived from the original on 2007-09-27 . "Japan's Crypto-Christians", Time Magazine . 2008 Beatification of Japanese Martyrs, Catholic Church Archdiocese of TOKYO . Orasho, "Website of Churches and Christian Historical and Cultural Heritage of Nagasaki", operated for the Nagasaki Prefecture.